When I wrote “High Hard Ones” 25 years ago, my goal was to provide the definitive insider account of Denver’s struggles to land Major League Baseball. 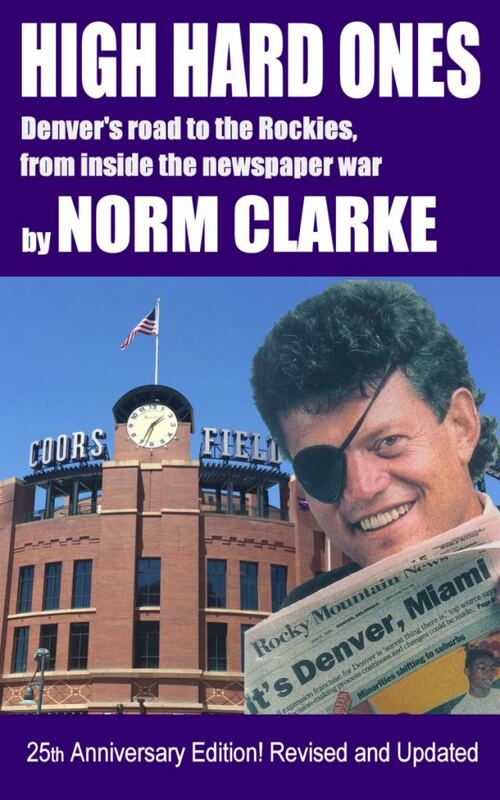 I wanted to follow up with this updated version to make sure that this remarkable story was documented for future generations of Rockies fans to appreciate the efforts of the many who made this franchise a reality. I created a new 10,000-word Epilogue with 60-plus additions to revisit the original cast of characters from Mile High Stadium to Coors Field. The Arizona sky dawned clear and bright over Tucson's Hi Corbett Field on March 6, 1993. At last, there were no clouds on Denver's major league horizon. It was Opening Day of the Cactus League season for the National League West's newest team, the Colorado Rockies. In a matter of hours, a standing room-only crowd would watch them play the San Francisco Giants. How fitting, I thought as I watched the teams loosening up, that Colorado's first opponent was a team from Northern California. During Denver's long and exasperating pursuit of a major league franchise, no cities teased Colorado baseball fans more than San Francisco and its East Bay neighbor, Oakland. While savoring the reality of Denver's long-awaited first spring training, I recognized Bob Howsam, mastermind of Cincinnat’s Big Red Machine dynasty, walking toward me. His round face radiated with a beaming smile.He obviously was enjoying the moment as much as l was, probably more. After all, he was Denver's first baseball crusader, and for 35 years had never stopped trying to help bring the big leagues to the Mile High City. We shook hands, and I said, "Bob, I'm really glad you're here to see this." Without a pause, he answered, "You put an awful lot of work into this, too. I’m glad we're both here." I chatted briefly with Rockies vice president John McHale, who during the previous three years had repeatedly demonstrated his willingness to tackle virtually any job that might further the baseball effort. Continuing his dedication, McHale had helped stadium workers wipe the last soiled grandstand seats at Hi Corbett just hours before the fans started arriving. "John," I said, "I gave serious consideration to asking for this day off." I really wanted to soak it all up, to kick back with a beer, sit next to some friends and just relish every pitch and every grounder. But the Rocky Mountain News didn't send me to Tucson to be a spectator, and another part of me knew I would not have been satisfied just watching. As game time approached, right-hander Jerry McMorris walked to the pitcher's mound. McMorris, who recorded his first major league save when he rescued the Rockies from financial uncertainty a few months before spring training began, toed the rubber, took the sign from catcher Joe Girardi and let fly with his ceremonial first pitch. A would-be high hard one, it missed its mark, low and away. The festive crowd was immediately forgiving. All day they showered him with thumbs-up gestures and calls of "Thanks, Jerry." But his friends gave the Rockies' charismatic Chief Executive Officer plenty of good-natured grief over the errant toss. "I was getting ready for Mile High, where you have to keep it low," McMorris playfully defended, thus recording another Rockies' first - the first alibi. Throwing out the first pitch in the first game ever played by Denver's major league baseball team is not something Jerry McMorris expected to do. That honor was conceded for years, first to Marvin Davis, then to John Dikeou. Still later, the probable starter seemed likely to be either Mickey Monus or John Antonucci. That there were so many “first pitch" hurlers who never made it to the mound is testimony to the supreme struggle Denver endured before finally joining one of America's most exclusive private clubs: Major League Baseball. That it was McMorris who wound up with the ball underscores the resilience and determination Denver's cause required. No other city that made it to the "bigs" experienced as many disappointments, or had its patience and resolve tested so completely, in getting there. The quest began in 1960, when former Gov. Ed Johnson and his son-in-law, none other than Bob Howsam himself, founded the Continental League. Their plan called for the "third major league" to field teams in New York, Houston, Minneapolis, San Diego, Atlanta, Buffalo, Toronto and Denver. But in a pre-emptive strike, the National League awarded expansion teams to New York and Houston. It killed the Continental League idea, and left Denver out in the cold. In 1968 the National League again hastily added teams, this time in San Diego and Montreal. Denver, with no ownership in place, again was passed over. Then came Marvin Davis' flirtation with Charlie Finley's Oakland A's in 1978. So certain was the sale that the American League gave Davis its blessing to hold a press conference announcing the deal. But Finley backed out, and the A's stayed put. In the next six years Davis tried to buy the Giants, then the A's again. He checked out the Pittsburgh Pirates and the Chicago White Sox. In all, he once said, he spent almost a million dollars on legal fees alone in unsuccessful bids to bring baseball to Denver. "We used to live next to the Davises (in Cherry Hills)," Kelly Ann McMorris reminisced during a conversation in the owner's box at Hi Corbett. "My dad always talked about how great it would be if Marvin Davis got us a team." Davis finally moved away in 1986, leaving the mantle of baseball savior to John Dikeou. But before Dikeou could deliver a team, he fell victim to Denver's then-reeling real estate market. "I remember I was driving home after work," McMorris recalls of July 17, 1990, the day Dikeou withdrew. "I heard on the radio that John Dikeou was not going to be a player (in Denver's baseball ownership picture). I was stunned." Denver was less than a month away from a six-county vote on a sales tax that would finance a baseball-only downtown stadium, and Dikeou represented one of the tax campaign's strongest selling points - a solid ownership foundation that was sure to appeal to Major League Baseball.